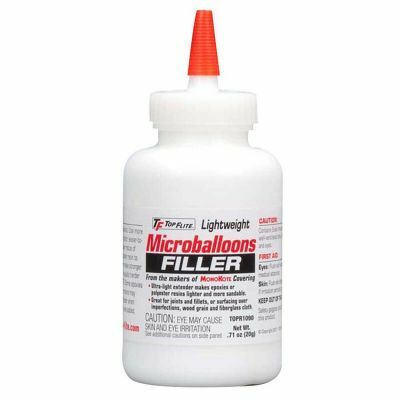 TOP FLITE SUPREME MICRO-BALLOON FILLER is ideal for thinning epoxy and poly-ester resins to make fillets or repairing surface imperfections. The ratio of epoxy to microballoons is a 3:1 mixture. Ultra-light extender makes epoxy or polyester resins lighter and more sandable. Great for joints and fillets, or surfacing over imperfections in wood grain or in fiberglass cloth. Convenient spout offers easy, no-waste pouring for clean,no mess use. Compatible with aliphatic resins and acetone based glues. Use of more than 3:1 ratio makes lighter and easy-to-sand filler Use of too much microballoons may degrade the surface adhesion of the epoxy of polyester resin. Epoxies & polyester resins may cure faster when using microballoons. Safety goggles and gloves should be worn when handling micro-balloon.